Marina di Scarlino, Maremma Tuscany - Two wonderful days of sunshine and strong Mistral breeze for the second ISAF Grade 3 match racing event organized in 2010 by the Club Nautico and La Marina di Scarlino. Nine teams from 4 nations faced off in Maremma racing on the six First 750 owned by the Club chaired by Guido Spadolini and directed by Carlo and Claudia Tosi. Finnish Oli-Pekka Lumijarvi, number 49 in the ISAF world ranking, secured the victory with 8 wins and 0 defeats: calling tactics on board Dane Sten Mohr, world leader in match racing. In second position Swiss Eric Monnin, number 31 with 7 victories and 1 defeat. Third overall and first amongst the Italians, Fabio Amoretti (4-4), followed by Giuseppe Angilella, former National Olympic 49er class (4-4), Marco Scalabrin (4-4), Robbie Allam from Great Britain(4-4) and Francesco Serena (3-5).Closing the rankings Andrea Mottola (2-6) and Fabrizio Onofri (0-8). The Race Committee was able to complete the full round robin, with all 36 matches taking place. La Marina di Scarlino’s intense 2010 racing season will continue with the Volvo Melges 24 class, a spectacular one design class that can count on a technical and large fleet. 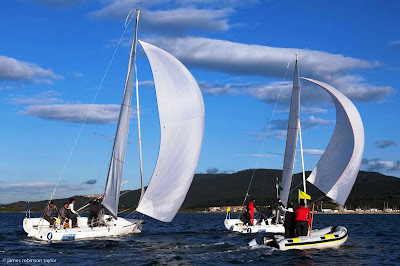 The Volvo Melges 24 Cup will be held in Maremma from 9th to the 11th of April. No less than 65 boats are expected, from 15 nations. Atlante Marina di Scarlino is a modern marina located in the heart of Tuscany’s Maremma. It is the first enterprise launched by the gruppo Atlante. La Marina di Scarlino is a major real estate achievement integrating apartments, shops, a club house, bars, restaurants, a fitness centre & Spa and all the necessary amenities for both visitors and residents. Apartments have a view of the gulf and of the Islands of Elba and Montecristo.